Web Host News – Overland Park, Kan. – As companies feel the pinch from the approaching “Tax Day” April 15, Codero is taking measures to assist small- to medium-sized businesses who need more powerful dedicated servers. The dedicated hosting and managed services company is reducing prices on its entire server inventory by 50 percent in order to help organizations purchase the computing infrastructure their businesses need most to remain competitive. All new servers purchased at Codero are included in the price-break. The company recently expanded its server portfolio adding nine new options to its server lineup in categories that include Webmaster Class, Professional Class, Enterprise Class models and Dell. Located within Codero’s green-powered secure data centers and backed by 24/7/365 support, servers can also be hosted in a PCI compliant environment. 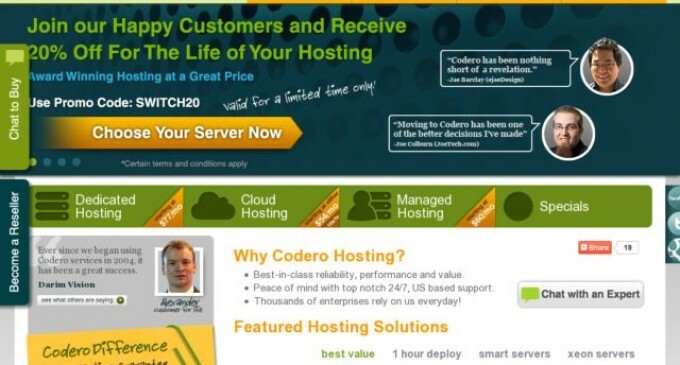 For more information on the server lineup and 50% off prices, visit www.codero.com. Specializing in dedicated and managed hosting services for small- to mid-sized businesses, Codero’s technology portfolio includes high-performance Windows® and Linux servers delivering advanced email, eCommerce, security and networking solutions. All Codero products are backed by SAS 70 Type 1 secure data centers, live 24/7/365 U.S.-based support and a seasoned staff with international experience in the hosting business for over 15 years. An industry innovator, Codero recently launched its Codero Rewards program and the Green with Codero Initiative, powering 100% of its dedicated server and managed hosting operations through renewable energy credits. For more information about Codero, please visit www.codero.com. Research, evaluate and learn more about reputable web hosting company’s at FindMyHost.com.